You'll be £8.99 closer to your next £10.00 credit when you purchase Vietnam's Final Air Campaign. What's this? The story is told here with clarity and supported by many well-selected images through the body of the text. 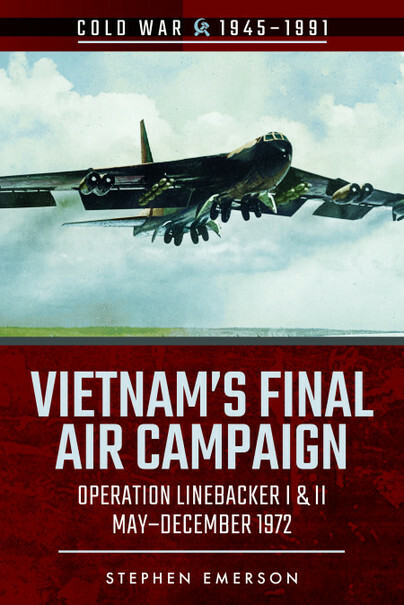 Stephen Emerson’s latest book covers the last year of operations in the air war in Vietnam and it is superb. He focuses on Operations Linebacker I and Linebacker II and he demonstrates how these operations were able to force the North Vietnamese to make the concessions necessary to end America’s direct participation in the Vietnam War. He sets the stage by describing the political situation faced by President Nixon and reviews Nixon’s strategy of Vietnamization and how the reduction of U.S. combat ground troops forced Nixon to rely on air power as his sole means of leverage in reaching a peace accord. Finally Emerson does a masterful job of describing how U.S. Navy and Air Force aircrews and planners put together a bombing and mining strategy to not only destroy and suppress the North’s air defenses, but also to cut off supplies from the USSR and China. The book shows the true courage that aircrews displayed day after day flying into the strongest air defense system in the world at the time. Despite heavy losses, these aircrews forced the North Vietnamese to accept an agreement that was acceptable to all sides. This is a well-written and well-told volume... it may be of interest to aviation and military historians, while readers seeking clarification as to what who did what and why during the latter days of the Vietnam War, may also find it informative. Due to the large number of aviation-related images military-aviation enthusiasts and aero modellers may also find this book useful in their researches. This story took place over 45 years ago so to many this is history only. I am of an age that I remember all this happening and reading the 'extra' information that was not widely known at the time makes for an interesting read. The book is illustrated with maps, formation diagrams and archive photos. Another good addition to this Cold War series and a very readable book. An excellent book exploring the geo-political pressures that forced President Nixon to order a massive bombing campaign against North Vietnam in order to bring the North Vietnamese to the peace negotiation table. The USA had decided that the ground war was to become the responsibility of the South Vietnamese regime but it was clear that the North enjoyed the means to win it. Airpower remained the USA’s only viable means to change that situation and secure a negotiated peace. The book explores the depth of planning and the sheer scale of the prolonged delivery of the campaign. A good narrative that offers significant insights into the end of the Vietnam War.